Many of these questions and answers don't apply to surface mounted dock lifts. 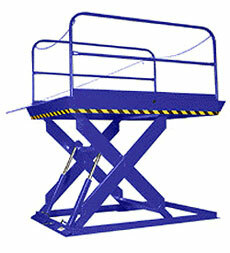 If you have questions about any type of dock lift, contact us for immediate assistance. Can the hinged bridge be mounted on the side of the platform rather than the end? Yes. It can also be off-centered on the side. Watch the axle loading capacity over the sides, however, because it is often less than over the ends. Can the hand rail location be changed? Yes, and at no additional charge. The rails can be put on the ends or in an "L" configuration. Can a truck or semi trailer drive over the lift? Yes, but only at slow speeds and only when the lift is fully lowered and resting on its mechanical stops. What happens if a truck hits the lift? It will probably be damaged, but the damage depends upon the impact forces. Can the platforms be made smaller than listed sizes? It depends upon the lift model. 8 feet long is the typical minimum length, and lifts can be made with as little as 4' in width. How long can the hinged bridge be made? 30 inches on all models except the 4000 Series. 24 inches on the 4000 Series. Consult us. When should a hinged bridge be split? It depends upon the application, but generally bridges over 12 inches on the 4000 Series and 18 to 20 inches on the other models should be split. How does the hinged bridge work? It's manually operated. 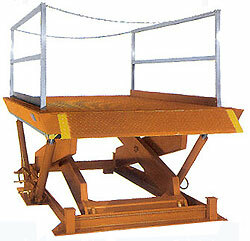 When the lift is raised to truckbed level, the bridge is simply kicked over onto the truckbed. To bring the bridge back, lower the lift so the bridge begins to cam back then simply flip it back with a foot or hand. What about full skirts or skirting on a lift? Federal regulations do not require full skirts; they require 8 inch bevel toe guards which are standard on pit mounted dock lifts. Where personnel protection is desired beyond that required by federal regulations, use Advance's electric toe guards. Fabric roller shades and accordion bellows skirting are not durable and because they do not provide a rigid physical barrier, their protection is based upon "what you can't see can't hurt you." Telescoping sheet metal skirt sections are more rigid, but are very susceptible to damage which makes them inoperable. Is it okay to operate the equipment on other than 230 volts/60 cycles/3 phase power? Yes. Motors and electrical components are designed to operate on 208V/220V/230V/240V/440V/ 460V/480V-60 cycle - 3 phase at no additional cost. Just specify the voltage so the correct motor overload heaters can be supplied. Can the lifts be operated on single phase? Yes, for an additional charge, but only on 230V/60cy/1ph and only the 5 HP units. The 7-1/2 HP 4000 Series units aren't available for single phase operation due to the amperage draw on a 7-1/2 HP single phase motor. Why isn't hydraulic fluid used? It isn't compatible with the hydraulic components and isn't as easy to buy as Dextron III motor oil. What happens to a lift if a hydraulic line breaks? The lift will not free fall. By ANSI code, cylinders are equipped with flow controls which prevent the lift from lowering faster than the greater of 4 times the normal speed or 30 fpm when fully loaded. What about velocity fuses? Velocity fuses are small hydraulic valves which are screwed directly into the hydraulic cylinder ports. If a hydraulic line loses pressure, the fuse closes so the lift won't come down until the line is repaired. Velocity fuses are very good devices for certain equipment. Why aren't velocity fuses standard on Advance Superdoks? The problems they create outweigh their safety advantage. They can lock up in cold weather due to thick oil and under shock loading which is common to dock lifts (loads bouncing over the ends or dropped onto a platform). One fuse can lock while the other(s) remain open which puts all the load forces on one cylinder which could result in damage to the lift. Advance offers velocity fuses as an option, but doesn't recommend them for multi-cylinder dock lifts. Where should the power unit be located? Wherever convenient, out of the weather, preferably inside the building within 30 feet of the lift. Where should the push button control be located? Wherever convenient as long as the operator can see the lift. Generally, the control is on an electric cord and hung on the hand rail while the lift is being used and then put inside the building when the lift isn't being used. For safety, the lift should always be operated by the person on the lift. How thick should the concrete pit floor be? That depends upon the floor loading and the local soil conditions (quicksand or rock). What kind of drain should be used? The best drain is one that goes into the storm sewer. The next would be a sump pump arrangement. The next would be a "French" drain or drain field. What happens to the lift if the pit floods? Water could get into the hydraulic system through the air breather ports in the cylinders requiring that the system be flushed out before rust develops in the hydraulic components. Can the three (3) inch conduit for the hydraulic line(s) be located other than shown on the pit diagram? Yes, it can be located anywhere along either long side of the pit or on either end, in the corner. When a lift is recessed into a three-sided pit at a raised dock and the lift is stored in the raised position, how is the front opening closed off? It usually isn't because there's no need to. If security is a consideration, night locks are used. Safety isn't a major concern because the truck blocks the opening when the lift is being used. Debris getting into the pit isn't normally a problem, but a simple plywood or sheet metal gate can be used when the lift is stored or Advance can provide a fabric roller shade skirt. Should bumper posts be used to protect the lift? They are recommended, but aren't absolutely necessary. The lift is usually down when a truck backs in so the truck is not apt to damage the lift. Where do the 8-inch concrete filled pipe bumpers go? On a 6 foot wide lift with a 6 foot wide hinged bridge, the pipes go on the sides of the lift, just outside the 3 inch curb angles and on a centerline with the bridge hinge. This will leave 8 inches of the 12-inch bridge projecting beyond the pipes. On a lift that is wider than 6 feet, the pipes must go in front of the lift and the 3-inch curb angle and be on 84-inch centers. The bridge should be increased to 18" to allow a 6-inch bridge projection beyond the posts. Can the lift be installed on top of blacktop? No, it will sink. A concrete pad is required. What does it cost to install a pit mounted dock lift? Naturally, this is a variable depending upon the application, but as a general rule of thumb, you can add 50% to the price of the lift. This 50% covers the cost of the pit, electrical work, mechanical installation, freight and taxes.